Atletico Madrid face Real Madrid in La Liga on Saturday in what is expected to be a hotly-contested derby with both sides desperate to claim local bragging rights. Atletico's bid for a second La Liga title in five years suffered a blow last week as they succumbed to a 1-0 defeat at the hands of Real Betis. Currently six points behind leaders Barcelona, it is imperative that Diego Simeone's side do not lose any further ground at the weekend against their arch-enemies Real. ​Los Blancos will be heading into the fixture brimming with confidence having won their last four in La Liga, producing particularly impressive displays in victories over the likes of Alaves and Sevilla in recent weeks. Santiago Solari's side, who are currently third in the league, will be looking to send a message out to the rest of Spain at the weekend as a win will see them leapfrog their city rivals in the standings. With the result of El Derbi Madrileno sure to have a significant impact on the outcome of both sides' La Liga seasons, Saturday's game is without doubt shaping up to be an enthralling encounter. ​Atletico will be without forward ​Diego Costa for Saturday's game as the Spanish striker continues his rehabilitation from foot surgery, whilst central defenders Stefan Savic and Diego Godin are both doubtful due to injury. Midfielder pairing Koke and Saul Niguez could make their returns for ​Los Rojiblancos at the weekend having participated in training this week. Alvaro Morata is expected to make his home debut for his new club and will be keen to grab the headlines with a debut goal against his former side Real. Los Blancos will welcome back Dani Carvajal to their starting XI after the full back missed their victory over Alaves last week due to suspension. World Cup winner Raphael Varane is likely to replace Nacho Fernandez at the heart of defence yet fellow centre-back Jesus Vallejo is not expected to feature due to injury. With ​Marcelo currently out of favour with boss Solari, full back Sergio Reguilon could make his first ever appearance in El Derbi Madrileno. Atletico and Real have met on 221 occasions throughout history, with Los Blancos winning 109 of their clashes and Los Rojiblancos being victorious on 56 occasions. 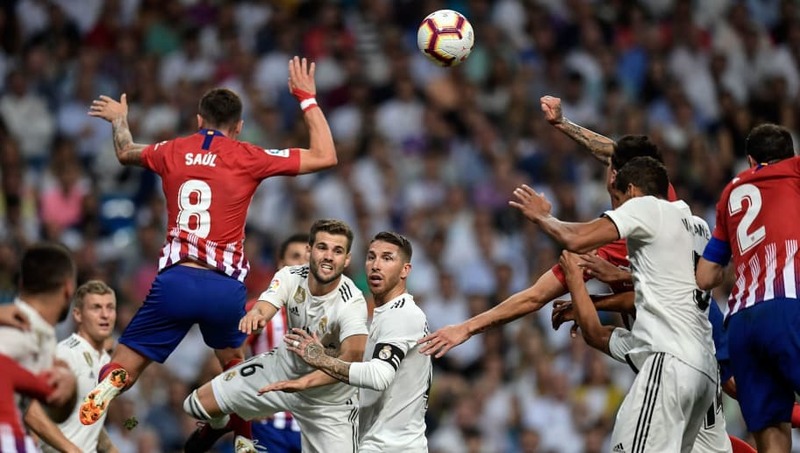 In the corresponding fixture between the two sides at the Santiago Bernabeu in September, the game ended in a stalemate with neither side being able to break the deadlock. The two most famous games between these arch-enemies in recent history both occurred in the Champions League final with Real coming out on top on both occasions, winning 4-1 after extra time in 2014 and 5-3 on penalties in 2016 following a 1-1 draw. Atletico have been experiencing a good run of results in recent weeks, winning three of their last five games in La Liga. However, an unexpected defeat at the hands of Betis last week saw Los Rojiblancos throw away the opportunity of closing in on ​Barcelona, who also dropped points in a 2-2 draw against Valencia. Real Madrid's recent form has been exceptional with Solari's side winning their last five games in all competitions. Victories over Alaves, Espanyol and Sevilla has seen Los Blancos close within two points of second-placed Atletico and seven of leaders Barcelona. With Atletico's defence notorious for their ability to keep clean sheets almost at will, Real's vibrant attacking trio of ​Gareth Bale, Karim Benzema and Vinicius Junior will have to be on top form if they are to lead their side to victory at the Wanda Metropolitano. Los Rojiblancos will be relying on leading marksman Antoine Griezmann to provide the firepower needed to beat their city rivals, with the Frenchman having scored five times in this fixture in the past. Although both sides will be desperate for a victory on Saturday, there is a real possibility that they could cancel each other out in a similar way to their fixture earlier on this season. In what should be a tense, enthralling affair, Atletico and Real will have to share the points, handing the advantage in the title race to Catalan side Barcelona. Prediction: Atletico Madrid 1-1 Real Madrid.